Raking leaves into big piles along the street for the county to pick up is in high gear this time of year. 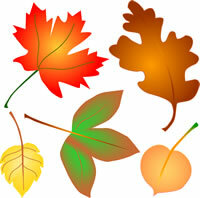 But an alternative to consider is mowing your leaves into a healthy mulch for your yard, and it’s a lot less work. Take the grass catcher off your mower and mow over the leaves on your lawn. You want to reduce your leaf clutter to dime-size pieces. You’ll know you’re done when about half an inch of grass can be seen through the mulched leaf layer. Once the leaf bits settle in, microbes and worms get to work recycling them. Any kind of rotary-action mower will do the job, and any kind of leaves can be chopped up. So while there’s a few weeks left for all the leaves to come off the trees, give the mow, don’t rake approach a try. It’s an easy way to treat your lawn and reduce the runoff into the gutters. A large, overflowing crowd gathered Monday evening, Nov. 4, at the County Regional Services Center, providing opinions to the Montgomery County Planning Board about what works and doesn’t work in downtown Bethesda. With a focus on listening to residents, the event was the first step in launching a new Sector Plan for Bethesda that will culminate in about a year with a proposal for the approval of the County Council, providing a fresh look at how Bethesda might evolve over the next 20 years. The new plan will revisit the 1994 Sector Plan’s recommendations, including issues related to walking, biking and environmental quality. There will be plenty of opportunities for residents to weigh in, including this evening, Wednesday, Nov. 6, 7 -9 pm at Imagination Stage. The Chesapeake Climate Action Network (CCAN) is sounding the alarm about a proposal to build a liquified natural gas export facility in Cove Point, Maryland, along the Chesapeake Bay, fed from a web of pipelines throughout the state that would deliver fracked natural gas to the facility. CCAN and other organizations are planning a series of town hall meetings across the state for people to learn more about the issue. Locally, a meeting is scheduled Thursday, Nov. 7, 7:30 – 9 pm at the Silver Spring Civic Center. Click here for more information. Energy Dynamics, one of the Bethesda Green Business Incubator companies, is competing along with a number of other start-ups across the nation to have an opportunity to pitch its product before Silicon Valley and Energy Sector investors. The company designs and manufactures devices that capture and store wasted energy in the electrical system and then recycles it on demand. The devices maximize the efficiency of electrical system utilization at commercial, industrial and residential facilities, yielding savings of between 6-12% on energy bills. Energy Dynamics is asking for a vote of support to pitch its product. Go here to vote. 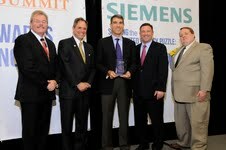 Pictured left to right: Robert Dixon, Head of Industry Affairs, Siemens Industry, Inc.; Montgomery County Councilman Roger Berliner; John Jabara, Founder of Savenia Labs; Howard County Executive Ken Ulman; and Eric Coffman, Senior Energy Planner, Montgomery County. John Jabara, Founder of Savenia Labs, a startup company in the Bethesda Green Business Incubator, received the Maryland Clean Energy Center Entrepreneur of the Year award at the annual MCEC summit this October. Since 2009, a team of scientists and researchers working with Savenia Labs perfected its 10-step process of independently testing popular appliances to determine each model’s energy usage. Today, Savenia Labs Energy Rating labels can be found in local stores to aide consumers. First Thursday Happy Hour — Celebrate Autumn, Sustainability and Trees with Bethesda Green and Trees for the Future. Enjoy casual conversation and social networking, Thursday, Nov. 7, 5-8 pm @ Jaleo, 7271 Woodmont Avenue, Bethesda, MD 20814. RSVP via Meetup. Two bills are under review by the Montgomery County Council, and both have to do with government management of trees in our region. The first bill, Bill 35-12, would require developers to pay a “tree tax” – when a Sediment Control Permit is required by the county, the developers would pay a fee to compensate for the amount of tree canopy being removed. 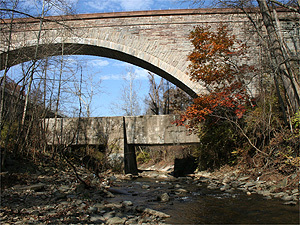 The fee would then be used by the County to replace the canopy within the same watershed as where it was removed. While detractors claim that it would prevent homeowners from performing tree maintenance on their own property, proponents in the Council say that simply isn’t the case. Councilman Reimer explained that the bill is basically a tree care and maintenance plan, and “the purpose of the bill… is to empower us to participate in how street trees are managed.” The bill is sponsored by County Executive Isiah Leggett and will require 5 full votes in the Council in order to pass. The second bill being discussed is Bill 41-12, which would allow Montgomery County to assume a more active role in managing its right of way trees. Currently, the County has to request assistance from the State of Maryland, and submit to its jurisdiction when it comes to the trees in question. The bill builds on existing authority to make sure that any work done where County trees will be affected will be done in a way that protects those trees. Additionally, the County is seeking to require a 3:1 replacement ratio for downed trees, which is much stricter than the state law. Developers are fighting both bills, claiming they are unnecessary. You can read counter-arguments to their claims here. According to a poll released last Thursday, the majority of small business owners support at least some of the Obama administration’s climate control and clean energy plans. Of those polled, 79% support a government-set national goal to increase energy efficiency by half over the next decade, while even more believe that government incentives for innovative clean energy technology should be a high priority. While the small business owners polled vary widely in their political leanings, the majority believe that energy efficiency makes sense for the environment and business, recognizing that clean energy policies are better for their bottom lines. To learn more about the poll and its results, please read the full Washington Post article here. Shop Whole Foods Today, Support Bethesda Green! Tuesday, July 2, all day, Whole Foods Bethesda, River Road. Trying to get some grocery shopping done before the 4th of July? Buy your barbecue supplies from Whole Foods Bethesda on River Road. Whole Foods has sponsored Bethesda Green for this quarter’s 5% day! Throughout the day, 5% of proceeds made at Whole Foods Bethesda will go to Bethesda Green and help support our continued work in the community. We have a team of volunteers at the store all day today, discussing our work, meeting with community members, and bagging groceries! Come by, get your errands done, and support Bethesda Green! Join Governor Martin O’Malley at the Maryland Climate Change Summit, Thursday July 25, 9:30 am, The Conference Center at the Maritime Institute, 692 Maritime Boulevard, Linthicum Heights MD. Governor Martin O’Malley, along with leading scientists, renewable energy business leaders, and climate change experts, will join together to discuss the progress that Maryland has made in reducing greenhouse gas emissions, further actions to be taken, and the implementation of Maryland’s Greenhouse Gas Reduction Plan. Maryland’s fight against climate change is especially important in the light of the recently released report that warns Maryland could see a sea level rise of over 2 feet by 2050. To take part in the conversation, and work for Maryland’s future, be sure to register for the Maryland Climate Change Summit today! Susanna Parker is the social media manager at Mark Leisher Productions and a volunteer with Bethesda Green.